read how the day went and what we found out. LEW was invited to visit the factory on the 20th November 2003 to tour the Esprit production line, which will close down in January 2004. This would probably be the last time we would get the chance to see the Esprits being built and meet the men building them. Currently the last few US Spec Esprits are being put together. Each Esprit has a poster in the window with a number and TO GO on it. 15 TO GO was a complete rolling chassis and ready to take it's shell. 14 and 13 where being built up. The day started at the gate. Security is pretty tight and after signing in I was given a pass for the day. 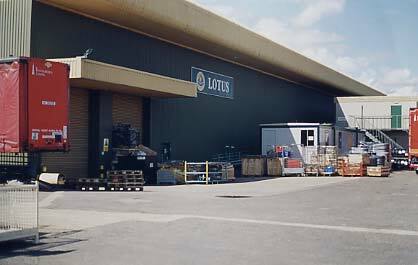 I then drove into the factory and onto the reception area, which also double as the shop, selling plenty of Lotus covered items, including lots of Norwich City Away Shirts with the large Lotus badge on them. There was a box cart racer Lotus had made for a race, a new Elise and one of the Lotus Olympic Bikes on show. I was met at 8.15am by Brian Angus, who would be showing me around for the day. After a quick chat about a few things, we moved into the office area. This is shared between Lotus Cars and Lotus Engineering. Lotus is separated into these two companies and people are employed by one or the other, but most work for either company. My first attempt to say hi to ex-service centre manager Neil Turner was made, but an empty desk was found (and would be for the rest of the day). A note was left for Russell Carr, but he wasn't about for a chat..
Moving on to the Esprit production line, we talked about Lotus's Engineering side and the amount of work done for other car makers. 50% of work done by Lotus is for other manufacturers. It's a very large part of the company and is taken very seriously. This is the main reason why camera's aren't allow on site, as Lotus are working on projects for other companies. Later in the day I saw a car that had been taped up to disguise it. I couldn't tell what it was, but in was a medium sized hatchback. I was told that everyday there's cameramen in the bushes trying to snap the latest model. Most of the track testing is done at night to stop pictures being taken. 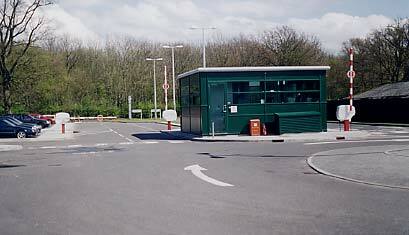 They do work for every major manufacturer and have test facilities that are utilised by all the big names. Including a test bed than can simulate the loads placed on a chassis and suspension while cornering and braking, allowing handling to be refined. On reaching the factory floor the Esprit production line has been reduce since the last time I visited. The Elise line has taken up most of the space, with storage and most of the trimming now done, there were Elise seats everywhere. 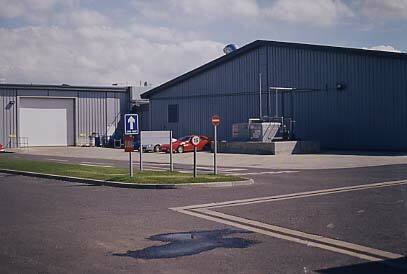 This is where the Exige's were being put together last time I visited. The Esprit line takes up two parts at the rear of the building. The first part is where the rolling chassis is made up. One guy makes up three chassis at a time. The bare chassis' are brought in and mounted on a wheeled frame. I was shown the bare chassis and a few changes were pointed out. When power steering was introduced in 1993 a section of the chassis was cut out to help with the fitting. More of a large indent. This would make retro fitting powersteering to an earlier model much more difficult. Also in 1999 the chassis was strengthened for the Sport 350's suspension. Some strengthening bars where added into the backbone and a plate where the gearstick comes out was added to reduce flexing. Once these modification where done, every chassis afterwards kept these improvements. Walking around the three chassis being build up was amazing. All these boxes of brand new parts, just sitting there, Suspension, AP brakes, brand new bolts and hoses. I was desperate for a supermarket sweep. I was shown the new suspension which is being used for the last US Spec Esprits. Top piece of kit. Made by Eibach, they are so light. These were used after a special request by the head of Lotus USA. I was also show how improvements were made to the gearbox over the years and how helpful Renault had been. The gearbox was regular updated by Lotus and as Renault own production was reduced. Lotus were allowed to do more work on it, improving it as the Esprit developed. The whole gearbox problems were explained to me and seeing the tight space it has to fit, I can see the problems involved. Gearbox's available for Lotus to order are rare, gearboxes with a production length guarenteed are are, Gearboxes that will fit in the Esprit chassis without hanging out of the rear of the car are rarer still. And of course the box has to be able to handle the huge amount of torque the V8 engine produces, which leave pretty much no possibilities left. Development of a new in-house gearbox is esimated at around £5 million. So the Renault gearbox was Lotus' only real option for the last 17 years. I also clarified the new gearknob availability for retro fitting to older Esprits. The overall Gearlever is shortened by about 15mm - it all happens inside the knob ! This gearknob will fit all Esprit variants with this type of lever. The only ones that cannot be updated are the very early cars with the old style lever. All the piping is fed through at this point with everything running through the backbone. One guy builds the chassis up to a rolling chassis, with three on the line at once. He gets some help to put the engine and gearbox in, but other than that he works alone. I was shown all the piping coming through at the front end for the radiators and oil coolers. Also where the old chargecooler used to go. The V8 wasn't chargecooled as the turbo boost is so low the engine doesn't really need it. Of course if you turn the boost up, it would help! Between the Chassis line and where the rest of the Esprits are put together all the body work is stored. Once the shell comes out of the VARI process moulds. All the windows and doors holes need cutting out, as the shell comes out as a solid piece. The windscreen the door openings are really thin glassfibre and are easily cut out. Then other holes are cut depending on what market the cars for, with cutting patterns for each piece. Left and right hand drive cars are cut completely different, so changing a car from one to the other requires quite a bit of fibre work on the shell. A build guide follows the car around as it's made up, so it gets the right parts and work done to it. All the bodywork for each individual car is painted together and kept together to ensure quality. I was also told that the body piece are individual for each car, that if you order say a new door. A standard door will be sent out to the dealers, which would be a pretty good match, but the dealer would still need to do some fretting to make the fit perfect. These really are handmade cars. I then asked about the wings put on the Esprit over the years. The have all developed in wind tunnels and do change the cars handling. But, most will not make any difference to the Esprit under 130mph. So for normal driving the wings aren't required. High speed runs is where they do most of there work, generating downforce and reducing lift. On to the second part of the production line, where the chassis comes over and are finished off. The line is set up in a large U shape. A rolling chassis comes in one end and comes out the other ready to go. The rolling chassis comes over on a wheeled trolley and only lose it when about half way around as the Esprit goes up on a lift for work from underneath. It then sits on it's own wheels after that. The shell gets bolted on with 12 bolts. Lights, radiators and wiring is all added first. The doors go on just after half way, as the interior is fitted. In the middle of the U, things like the radiator, heater units and doors are made up before being fitted. Right in the middle is the Esprit trim shop. A couple of guys make up and trim the Esprits interior just before it goes on the car. There's no boxes of trim, it's actually made for each car as it goes around the line. Things like the dash board instrument panels are supplied as one piece. The doors are made up as it's donor comes around the line, with each door mounted on a support so all the pieces can be added. The frame gets it's glass and is then bolted onto the door shell, the side impact bars are bolted in, the window motors are added (Lotus use Omega for the UK spec cars and Holden's for the US market, as you can't have a one switch window in the US). The trim panel is added later as all the wiring needs to be connected up first. Other things I found out while on the line where very interesting. The rear light change for the 2002 model was made as the Toyota part had become unavailable, which means basically there wasn't enough about to keep adding them to new cars. So the rear lights had to be changed, rather than a styling exercise. A few different set-ups were tried including two round lights mounted to a similar shape moulding of the old lights. The set-up used in the end was mainly decided upon because it meant only one new mould needed to be made for the whole rear, reducing costs. I also found out about the red hose on the earlier cars. Lotus used these hoses from a supplier and tested them in extreme weather conditions without any problems. Lotus believe the quality of the hoses supplied wasn't up to standard, with the suppliers giving Lotus poorer items and service because of the lower volume order. This seems true of a few parts. Suppliers push Lotus to the back of the queue if larger manufactures place larger orders. Lotus get there parts later and it seems of a slightly more substandard quality. Lotus check some of these items, but can't check every part and have been let down by their suppliers. This is also true of some of the fixings, with rust coating not lasting as long as they should. The engineers have put together a package of organically coated bolts that would stop them rusting. These fixing have been shown to the management on two occasions, but as this will not increase sales they have been rejected. Money men getting in the way again. I also asked about the petrol tanks that have been rusting. Again, the coatings supplied have not been up-to-standard, with Lotus complaining to the manufacturers. The tanks coatings where changed in 1996, so hopefully later cars will not suffer the same problems. The manifolds were also looked at by lotus and strengthen. The cracking is mainly due to the manifold needing to 'Breathe' as it expands with the heat build up. Most of the development on the Esprit has been taken up by either Emissions or Safety. Because the Esprit is sold in the US, it must meet all the spec for cars being exported to the US. Some of the things Lotus have had to spend there budget on are amazing. All US cars must be able to be crashed at 2.5mph and have no damage to their bumpers (including paint cracking). This is because a lot of US drivers use their 'bumpers' to park and if they get damaged, there are huge amounts of insurance claims. Also low impact crashes must leave the Esprit with all it's lights unbroken and working. This now means the bumpers lights are mounted in foam, so in a crash the lights push back into the bumpers undamaged. All US cars must also check for fuel leaks in their tanks (must have heard about the Esprit's problems), so Lotus had to redesign the fuel tanks. Reducing there capacity to allow a sensor and pump to pressurise the tank at startup. This also meant reprogramming the ECU and changing the wiring loom. Another condition for passing the US spec is bonnets and boots that can take one of the test dummies and be shut, must have a cable that can be pulled to release the bonnet/boot, this must also have a glow-in-the-dark tag, so trap ''Dummies'' can see it. This was easy for the Esprits boot as it already has a cable stretching the length of the rear. The problem Lotus had was they could fit a 3-year-old dummy in the front boot (even with the spare wheel in) and shut it. The mechanism for the front boot would need to be completely changed to meet US regulations with huge costs involved. So what Lotus did, was produce a plastic round-ended cone that they now stick on the inside of the bonnet. This goes down into the space where the dummy could fit, so with the dummy now unable to fit in the space it didn't have to rework the front boot mechanism. Following this on, I was told that the pillow under the seats (which has been made to fit in it's own little compartment), was only added to raise the test dummy to help the car meet cash testing requirements. I was told to just bin it, as the car has to be sold as tested, so they couldn't take it out. The amount of work that has to go into meeting US regulations is killing and has been killing the Esprits development budget. I was told, to change the colour of the seat belts would mean setting up all the dummy crash testing again with cost pushing into the thousands. This is why the door handles took so long to replace. Because they need to work in a crash, if you change them, you need to do all the crash testing again. The three crashed cars must also be kept for 10 years. Making the cost of a small change huge. The same goes with seats, all the testing needs to be done again, which is why Lotus took so long to change their seats in the earlier cars. As we moved down the line, we came to a yellow Esprit up on the lift, giving a great view of the exhaust system. This give no extra performance than the UK one, but sounds much better than the UK version. The Americans wanted a better sounding exhaust note, so it was changed. Its amazing how tough the US regulations are, but loud exhaust aren't a problem, which seems to opposite of this country, with exhuast getting quieter and quieter. I also found out about the CATs. Because of the low boost the V8 produces the exhaust doesn't restrict the engine, so removing the CATs will have little effect to performance as it's a free flowing system as standard. Talk then moved on to how the exhausts have sounded over the years and the bad press they have been given. This again is down to the noise restriction and US/European emissions. Lotus engineers have made the exhaust note sound beautiful, but have had to change it to meet testing. Because of Lotus's work as an engineering company, they feel they have to do everything by the book. If found to be bending the rules with testing, it would have a massive impact on there engineering work. This is why Esprits have always sounded poor compared to 'other' cars. Lotus have had other makes of cars in, known for there sound, and tested them. None of them pass neither noise or emissions requirements to be sold. I was also told of a story at one of the testing centres, where a certain company's car could be seen with glowing sparks and material coming from its exhaust. Wire wool had been placed in the exhaust to reduce the sound and was burning out of the Exhaust. A while ago Major manufacturer was caught cheating during testing. Having a switch to disable it's engine management system for certain parts of the test. They were heavily fined and testing has now become much more strict. This is the sort of publicity that would spell the end for Lotus engineering company. Its seems again the playing field is anything but level. With suppliers taking advantage of Lotus's lack of clout and large orders, having to play by the rules where others aren't and having no 'Parent' company to help out financially and will a parts bin to raid (no disrepect ot Proton here). Lotus have a massive disadvantage when producing sportscars. Add that to the fact that 100% of all its cars meet the toughest regulations in the world, the Esprit has both it's hands tied behind it's back. Still putting up one hell of a fight! After the production line, I got to see a few of the finished Esprits awaiting inspection. There was two right-hand drive Esprits waiting, which were going to a new dealer in Japan. One in blue had a Sport 350 wing, which had to be made from scratch, as there was none in the spares department. The other Japanese car was white and had the European style exhaust. 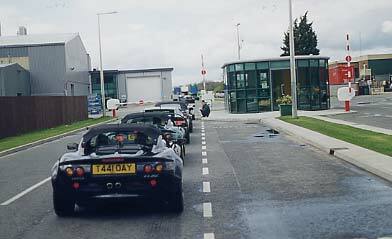 Once each Esprit has been checked, it is driven around Lotus's test track and then checked over again. So Every Esprit has had a few laps of the test track! Never believe the 'never been tracked' on an advert again. I then moved on to the engine build department in a separate part of the building. This room just has two guys working in it, surrounded by V8 engine parts. These guys build an engine each every 3 days and were currently working on 12 and 13 from the end. I got to feel the weight of the bare engine block, which was pretty light. All the parts just sitting in racks was an amazing sight. I chatted to one of the builders about the engines and Lotus Esprit World. He showed me the plaques with his name on that sit on the engine. Lotus only order enough for all the engines and one for each of the guys! I also got to see what the problem was with the engine liners that cause all the problems with the early V8s (and it seems up to 1999). Lotus have had two 3.5 NA V8 engines built and have had them running in Esprits for testing. As in the past, Lotus have always looked at the V8 as a powerplant. I also saw an old 4.0 V8 and 4.4 V8 that had been built and used for testing in the Esprit over the years. They have also tested aftermarket gearboxes, so it wasn't as if they weren't trying to fix the things we wanted fixing. They have the knowledge and the means, just no money. But having said that. If the Esprit would have been developed like it could have been, then the price would have been pushing that of a Ferrari, and I for one can't afford one. So it's faults and lack of development mean I get to own the most beautiful car in the world. So there's always a bright side. I also got to meet the people in the trim shop that have trimmed my Sport 300 seats. Killing two birds with one stone, I picked up my second seat up while I was there. There are really some great people who work at the factory, and those in the trim shop are some of them. I was shown some of the aftermarket stuff they can do for the Elise owners and there was two Esprit interiors in for a re-trim, including one Essex having it's red leather redone. Another interesting fact I found out (which you may know), is that the Elise was originally only meant to be a run of 400 cars. It was never meant or designed to be produced in the numbers it has been. This gave Lotus real problems. Again with suppliers who were only asked to make 400 item and then being asked for a constant supply, which they may not have been set up for. Also with so many small engineering firms going bust all the time, it caused a lot of difficulties, as with the Esprit. With the Esprit becoming more and more difficult to keep up with the US regulations and no other car available for the US market. Lotus were looking like they would fall out of the US market place. Once dealers have no new cars to sell, they move on to other marquees and Lotus would lose it's US dealers, making it very difficult to sell cars in the US again. This is why the Esprit has had a stay of execution over the past 3 years. With the M250 not meeting US regulations, Lotus had to make the Elise sellable in the States. This has taken over 2 years, as the original Elise didn't meet many of the safety requirements and it's engine none of the emission requirements. European production of the Esprit was slowed down and eventually stopped, to give the US more cars to keep the dealers happy. This gave Lotus breathing space to get the Elise ready to take the Esprits place. With the last few coming off the production line in January 04, add shipping to that and your looking at the last few Esprit finding new homes in the US in March/April. Just as the new Elise becomes available. Finally, I can confirm that a project team is currently working on the new Esprit. It will be called the 'Esprit' and will look like an Esprit, not a blown up Elise. Also prices should reflect those of the last Esprit and are unlikely to be inflated to Ferrari & Porsche prices. No more information was available. My visit has helped me understand the Esprit and Lotus more and has deepened my love for both. Never playing to the same rules as others with more money and means, but always coming out with brilliant results. Maybe money would make Lotus lazy and they would end up like other manufactures. It's a bit like the music business, bands make there best music before all the money comes in. Once they are set up the quality of the product decreases. Looking for ways around spending huge amounts of cash seems to be the way to producing something special. The views contained in this page are those of Lotus Esprit World and not of the Factory, Lotus Cars Ltd or Lotus Engineering.